The best part of professional installation is that you get to sit back and relax while your system is installed for you. Typically, when you call to order your security system, you’ll nail down a time that will work for you and a professional installer, so you can be home while the system is being installed. Depending on where you live, some companies can come to your home the same day you call, so your waiting time is minimal. Another reason to choose professional alarm installation is that you benefit from a professional’s experience. An installer can make sure your equipment is set up correctly, walk you through the ins and outs of your system, and make suggestions for how to best secure your home. Although professional installation has its perks, it’s not without drawbacks. There’s usually a bigger upfront cost in the form of installation or activation fees. It can also be inconvenient to schedule a time to be home when an installer is available. Furthermore, if a system requires professional installation and you move to a new property, you may have to pay a second installation fee to move your equipment, or even leave some equipment behind. No Work For YouYou can just sit back and relax while someone installs your home security system. You won’t need to worry about if you did it wrong or spend time listening to automated directions or reading a pamphlet. You’ll need to clear time to be home during the install, but you can get other things done during this time and leave the work up to the professional. Professional expertiseIf you go it alone with DIY, there’s a chance you might miss something. This could cost you a lot more time and effort or worse, cause you to suffer an undetected break-in. Plus, if a professional technician comes out to install your system, you’ll be able to take advantage of his/her knowledge. Get the most for your money by asking him/her to walk you through your system, its functions, and how to operate it. That way, you can experience success from day one. Possible DiscountsIf you pay for a professional alarm installation, companies might include cost-saving incentives. This is subject to availability, but look out for promotions that will give you more equipment or package upgrades if you pay for an installation. Installation feesIf a technician has to come out to install your system, it’ll cost you. You can expect to pay up to $300 for this type of service unless there’s a promotion going on. Less control over system setupWhen you install a system yourself, you can do everything you want. A technician is going to set it up standard. If you want them to customize everything, make sure to ask or you’ll end up having to do some work yourself despite paying for the service. Must schedule an appointmentYou’ll save time by not having to install your home security system, but you’ll still have to make time to be home when the technician comes. If you’re busy, this could be a pain since you’ll have to clear your schedule to get your equipment installed. ADTADT is the biggest and oldest home security company in America. Right now, it has an offer for a free installation on the Pulse® package and a free camera (valued at $449). You should know that this isn’t always an option. However, it shows that for most home security packages, you’ll pay a few hundred dollars for installation fees. VivintVivint leads the home security market in technological advancement. It is a 100% wireless company, so installation isn’t as invasive as other landline-based systems. Protect AmericaYou can opt for professional installation from Protect America, but since the company advertises its products as “peel and stick,” you really can do it yourself. Professional installation costs $199 from Protect America, so that’s a lot of money you can save if you do it yourself. XFINITYXFINITY home security systems offer the bells and whistles of a convenient app and home automation features. Depending on your package, the professional installation from XFINITY is pretty pricey. Unless you choose a security system and plan with free installation, you could pay up to $500 in installation fees. Smith MonitoringThis Texas-based security company serves both businesses and private residences. Aside from super affordable pricing—plans start at just $17.95/month—Smith Monitoring offers free installation and activation on most plans. Compared to other security companies, Smith advertises up to $200 in savings. 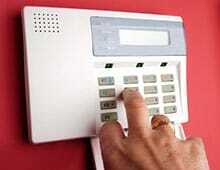 AlarmForceChoose from condo, home, business, or vacation home security systems with AlarmForce. No matter where you install, you might be able to enjoy free installation on some packages. Otherwise, this professional service costs anywhere from $99 to $199. You can read more about some of these companies and their offerings on our top providers page. The best part about DIY installation is that it’s free—you don’t have to pay installation fees. Plus, when you install your system yourself, you don’t have to wait around for an installer. With do-it-yourself security systems, you can usually reconfigure your equipment or add more as you see fit, without having to hassle with an installer. Often, with do-it-yourself installation companies (such as FrontPoint, SimpliSafe, and Protect America), you own the equipment, which means if you move to a new property, your equipment will move with you, with no fees and no hassle. The secret of DIY alarm installation is that it’s easy. Even though professional installation requires no work on your part, the “work” required for most do-it-yourself installations is minimal. Most customers, especially those from FrontPoint and SimpliSafe, report that setting up a security system is indeed quick and easy. Self-install alarm systems are completely wireless, so you don’t have to be handy with tools. And since most of the components come standard with adhesive backing, all you have to do is place your sensors and control panel around your home and activate the system. Better yet, you don’t have to do all the work on your own, because companies with DIY installation provide guidance as you go. When you set up a system from FrontPoint or Protect America, you simply give them a call, and they’ll walk you through the process over the phone and make sure everything is working properly. With SimpliSafe, the control panel will give you electronic prompts to help you along while you’re setting up. In all cases, customers say that they’re able to set up their systems in about 30 minutes with little to no hassle. Although there are many benefits to DIY installation, it also has some drawbacks. You may not be a security expert, and therefore, you may question whether you’re setting up your equipment correctly. True, you may talk to a professional over the phone, but that professional cannot see the inside your home and may not be able to make specific recommendations that an in-person professional installer would. Save Money On Installation FeesDoing it yourself means saving money. If you’re a handy person, this shouldn’t be too difficult. This also depends on what kind of system you install. If you go for a wireless package, you won’t need to drill holes or bring out the heavy tools. If you choose a hard-wired system, it might be a bit trickier. Install on your scheduleWith a professional installation, you’ll need to make an appointment. You’ll have to make sure you’re home and this is typically during weekday business hours. With DIY, you won’t have to adapt to a technician’s schedule. You can install your system at midnight, the middle of the night, or on Saturday morning if you’d like. It’s all up to you. Adjust system how you want itSet up your security system exactly how you want it when you do it yourself. You could always tell a professional how you’d like it set up, but this saves your breath and allows you to do it your way. No VisitorsIf you’re having a technician come out, you might feel obligated to clean up or make your house presentable. If you’re already busy and don’t have time, you won’t have anyone to impress but yourself when you choose a DIY installation method. If you’re not a fan of service professionals traipsing through your home, you also won’t have to deal with this. You do the workYou’ll need to read the whole manual, spend time on the phone with customer service, or listen to a pre-recorded set of directions when you do it yourself. This is quite an undertaking sometimes if you choose a complicated system. You’ll also need to hang equipment, connect it to landline, internet, or cellular network, and work out all the kinks on your own. If things go wrong, this can take up a lot of time. No in-person professionalOnce you set up your system, you’ll also need to teach yourself how to use it. When a professional comes out to install your home security system, they can walk you through it and show you how to use every feature. If you’re good with technology, this probably won’t scare you. If you know you would feel more comfortable with professional guidance, know that DIY doesn’t offer that. Higher Equipment CostSecurity companies make more money if you choose a professional installation. If you do it yourself, you might have to pay more for the equipment and you may not qualify for warranties if they can’t guarantee you installed your system correctly. This could get you into trouble down the line if your home suffers a robbery or fire and the security company claims the system was installed incorrectly. Having a professional do it gives you an iron-clad case. FrontPointFrontpoint is a SafeWise endorsed security company and offers DIY installation to customers. That’s probably because the whole company is 100% wireless—making its equipment easier to install. Normally, professional installation starts at $99, so this is a good opportunity to save a lot of money by doing it yourself. SimpliSafeSimpliSafe is another 100% wireless and SafeWise endorsed company. It offers a lot of cost savings to customers because it allows self installation and doesn’t require contracts. You can also get refurbished systems to save more money. On average, installations by a professional technician cost $199, but with DIY you won’t pay a cent. Protect AmericaProtect America is proud of the fact that its equipment is “peel and stick,” so it’s very easy to install yourself. You won’t make holes in walls or have to spend anything on installation fees-saving you $199. 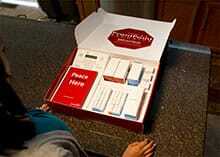 Its packages are also some of the cheapest in the industry and start as low as $19.99. ScoutScout is an extremely affordable security company with the added bonus of no annual contracts. Packages start at just $9.99/month and you can easily install it yourself since all equipment is wireless. Next articleRing Door Bell Slashes Prices!